Product #20945 | SKU DBSUB18H | 0.0 (no ratings yet) Thanks for your rating! dBTechnologies' new subwoofers H Series offer remarkable specifications and user-friendliness. With 1000W (1400W Peak Power) and a high-performance 15" woofer with 3" coil, the Sub 15H is especially suited for small to mid-sized events, where high performance needs to be packaged into compact size. Whenever a lower extension is required, the perfect choice is the new Sub 18H, equipped with a 1500W (2000W Peak Power) power amplifier and a high-performance 18" woofer with 4" coil. Thanks to their unique configuration, termed Hybrid Horn-Loading, the boxes can be tuned to the lowest frequencies to improve system efficiency and convey a deep, enveloping sound. Unlike conventional horn loaded systems, 15H and 18H subs ensure excellent efficiency even at close listening distance, which makes them suited for use even in small venues. The new 15H sub offers stereo inputs with selectable link or crossover outputs, a crossover frequency switch at 90 or 120 Hz, a phase inversion switch and built-in delay up to 4.5 ms (adjustable in 0.5 ms steps). The delay helps you to improve the correct coupling with the whole line-up of dB Technologies full-range speakers, and to make advanced subwoofer configurations without the help of any external processor (Cardioid or End-Fire or Straight Line). As a matter of fact, the built-in features - variable crossover frequency, phase and delay - let the new Sub H Series be compatible with any other speaker of our lines. The subs also feature a mini USB Type-B port to update system firmware and retrieve a telemetry log file that provides information on abnormal events, usage time and amplifier status. The latest-generation digital amplifier Digipro G3 ensures excellent performance and low energy consumption thanks to its highly efficient, yet very lightweight system. The auto-range digital power supply allows it to operate both on 110V~ and on 220V~. The new 28/56 Bit DSP with 24 Bit/48KHz A/D conv. provides sound performance above all expectations and perfect system control even under the most extreme operating conditions, thanks to its advanced limiting functions. The PVC faced birch plywood speaker box is extra resistant also thanks to polypropylene edges that protect it from scratching or impacts during transport. This unique Hybrid Enclosure Technology offers outstanding strength and durability, making your speaker truly road-ready, with their exclusives Aluminum heavy-duty handles. The M20 threaded mount on the top end of the box permits any type of full-range speaker to be installed using a standard pole with M20 thread. 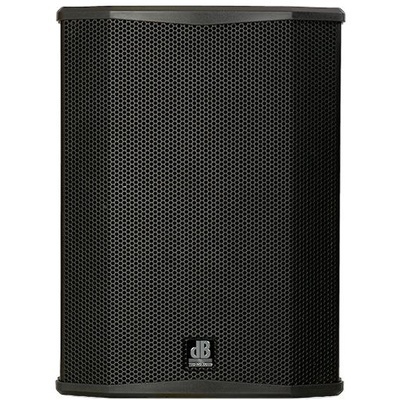 DS2-S mini pole is also available as an option to adapt any dB Technologies speaker to 15H and 18H subs.